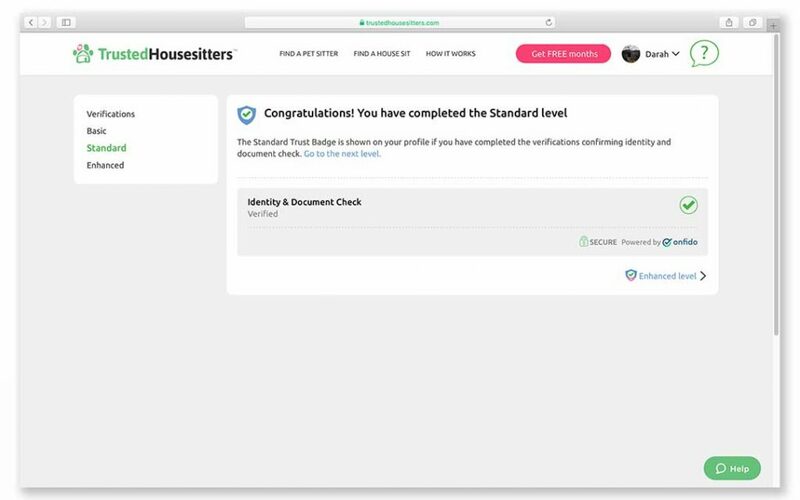 Have you ever heard of Trusted Housesitters? If not then hear ye hear ye, traveling friends! It’s a great way to stay in a destination for free and fill any pet shaped hole in your heart. We were recently offered 4 pet sitting opportunities and wanted to share the secret to our success! Free housing is the cheapest way to travel! It was so hard at first. We were quite downtrodden, kind of losing hope, all that sad stuff. Our goal was to be in the United Kingdom for March and April, but only if we could find a house sit. The UK is pretty pricey compared to our current lives in Asia and homestays were more than double what we’re paying now. Even though there was no success for weeks, we kept applying to sit after sit, checking the website daily. Scotland, Wales, England, we tried for all of it. Most people did reply and said that we were great and all, but they chose someone else for such and such reason. The most common reason for us missing out on a sit was because the host preferred someone local. Understandable. Frustrating. But understandable. Then just like that, it happened. One day we were offered two sits, one right after the other. A few days after that we were offered 2 more sits. Whoa! When you think it’s not going to happen, take our advice and just keep going! It’ll happen. Below are some tips we put together to help you have the same success when getting a house sit. Because who doesn’t want free housing while seeing the world?! It’s not hard to do and you should get started on it immediately. There are 3 levels of verification. 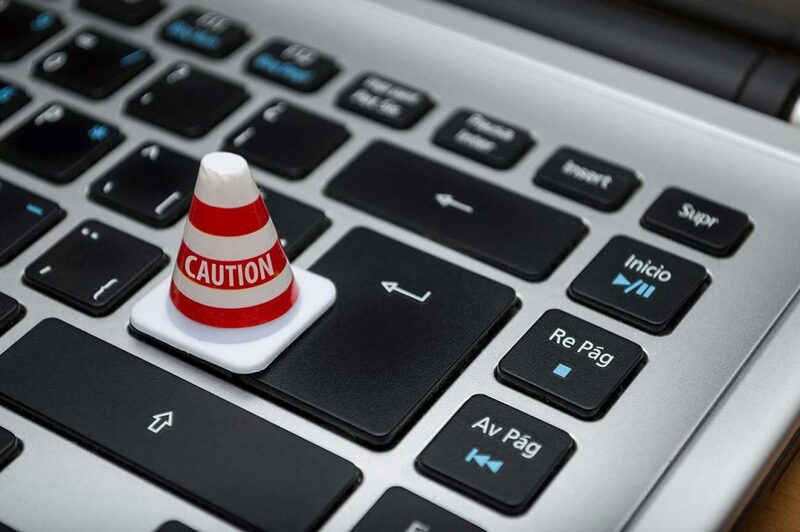 The basic level of verification includes confirming your email address, phone numbers and gathering references. References can be personal or professional and even from past landlords and can even be as short as one paragraph. We were fortunate to receive 6 references fairly quickly. 2 from past landlords, 3 from various family members we’ve house/pet sat for and 1 from Darah’s best friend, who wrote a short novel. Once that is complete you can start working towards the standard level of verification. For this level you have to do an identity check. They’ll compare your name, date of birth and address to verified databases. You’ll also submit an identifying document like a passport or driving license and that will be checked in various databases to make sure they’re not reported as lost or stolen. The third level of verification is a criminal record check. They use a third party to check if you’ve had any convictions in the last 5 years. 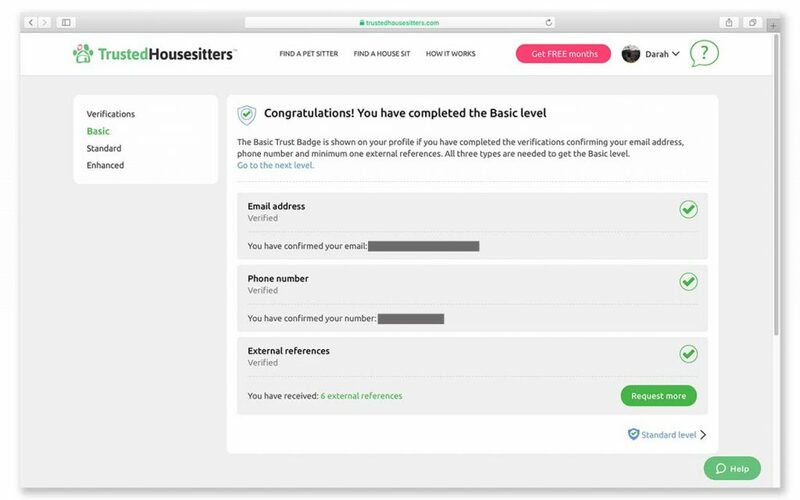 At this moment, the criminal record check isn’t available through Trusted Housesitters (apparently there are complications with the third party) but not having it hasn’t hurt our chances of getting a sit. Most of the house sits include watching pets so you have to make your profile ooze with how much you love furry friends. You can start making your profile while you’re waiting on the verification process to finish. Have a photo that clearly shows what you look like. Then include as many photos as you’re allowed and make sure they show as many animals as possible. 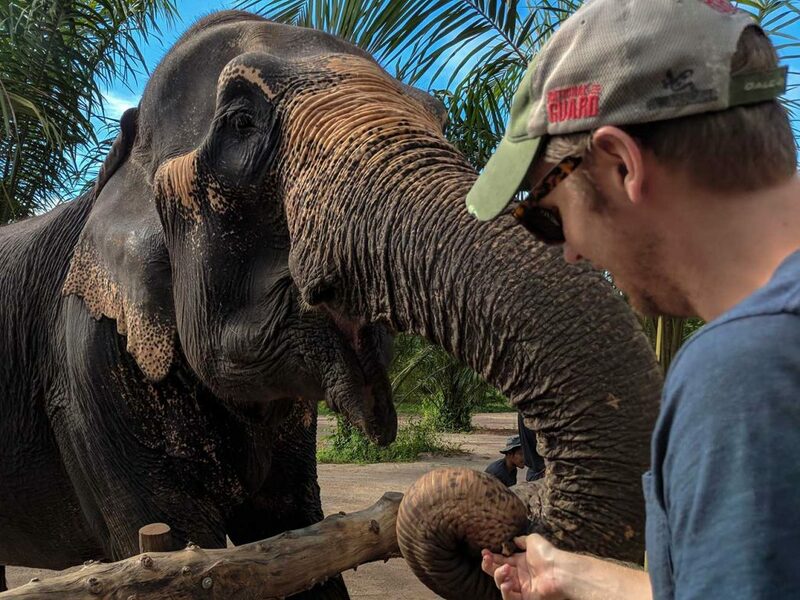 Most of our photos include our dog Luna but we also have a picture where Darah is petting a stray cat in Italy, Garrett is scratching our host’s dog in Bali and a great picture of Garrett giving an elephant in Thailand some love. You can have 6 photos of you with pets and 6 photos of you and your interests. We recommend using all 12 of these photos so the homeowners and pet parents get an idea of who you are. The more the merrier! There are 3 sections to your bio. The “About Me” section is just that. Everything you want the host to know about you. We went into great detail about who we are, gushed about our dog and explained how she’s from the shelter and was a lot to handle at first, and finally talked about our dreams. 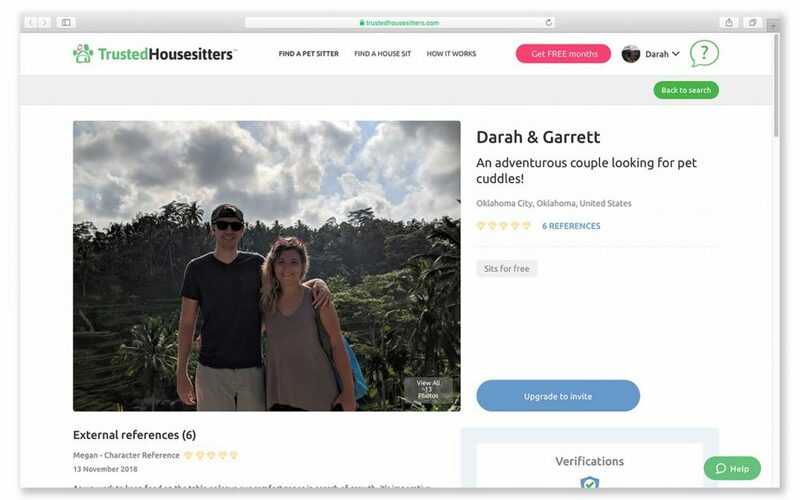 We also included a quote of a review an Airbnb host left of us to show that we would be responsible guests to whoever chose us to sit. Then there’s the “why we want to house sit” section and we were honest and said we were travelers and wanted to use this as an opportunity to see the world. We also talked about how we missed our dog Luna and being able to take care of other people’s pets would help fill the Luna shaped holes in our hearts. The last section is where you talk about your experience. If you have your references then you can mention them and sum up what is said. We brought up the fact that Garrett grew up with many animals like chickens and rabbits and talked about our experience with raising Luna and the other dogs in our lives. 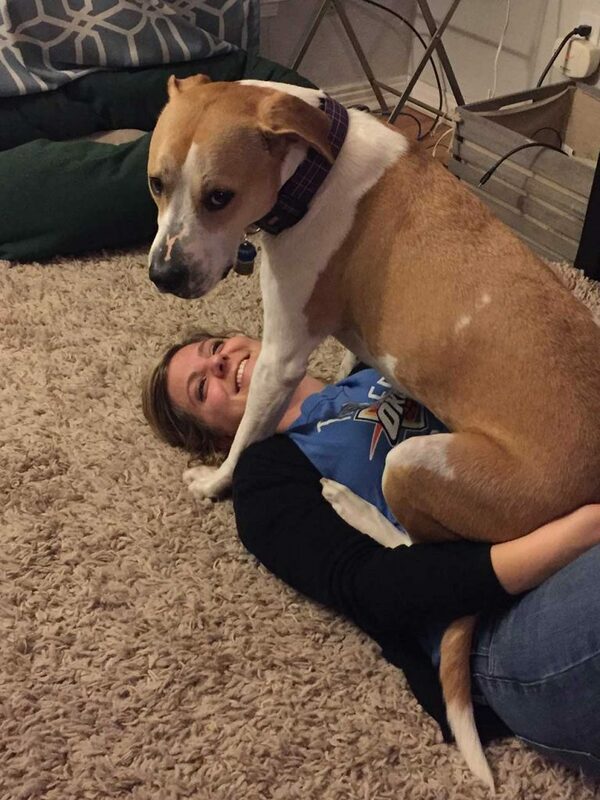 We did not do this and we still got sits. If you do choose to do a video then be sure to show them your personality. Be warm and welcoming and summarize everything you wrote out in your bio. Short and sweet is best! Just keep that smile on and be yourself. When applying to sits, it’s important to read through all of the details a host has on their listing. We typically have 3 paragraphs in our applications. In the first paragraph we introduce ourselves, talk about what we do, throw in a mention about Luna, and tell them how excited we are to contact them. Because we’re freaking excited! In the second paragraph we go into why we would be the ideal couple for their sit. If it’s a dog sit then we go into detail about how we would extend the same love and care to their dogs that we would give our own. This paragraph is also where it’s important to have read the listing as a whole. If the owner has a pet with special needs or a specific routine then you need to explain why you’re qualified to take care of their dog. For instance, someone mentions their dog goes on daily runs then we mention how we ran a half marathon in April 2018 and took our own dog on some of the training runs. If a pet requires medicine then we talk about the experience we have with giving our own pets medicine. Our last paragraph directs the homeowner and pet parent to our profile so they can learn more about us. Fingers crossed that they read it! Since we received an FBI background to teach we also offer to send them to the host if they wish to see them. You can also offer to Skype or Facetime them if they’d like to get to know you better. We’ve had one host Skype us and offered us the sit on the spot! The others have just offered us the sit after a little correspondence. Be sure to thank the host for their time and tell them you hope to hear from them soon. Now this is the important part. Read and reread your application. We can’t tell you how many times we’ve made a mistake and didn’t realize until after we hit send. Actually, we can. 2 times. That, my friends, is 2 times too many! We unfortunately addressed an application to the wrong name BUT she ended up giving us the sit anyways (probably because we immediately sent a message apologizing). We consider this extremely fortunate. Take our advice, don’t try this at home. Ensure you have the correct information in your application message. It’s the simplest yet hardest thing to do. Just write it all out. Check it over. Step away for a minute. Come back and read it again. Your future self will be happier and not call your past self stupid and careless. This wasn’t the case for us, but we’ve found that some people prefer experienced sitters. That’s hard for us first-timers. 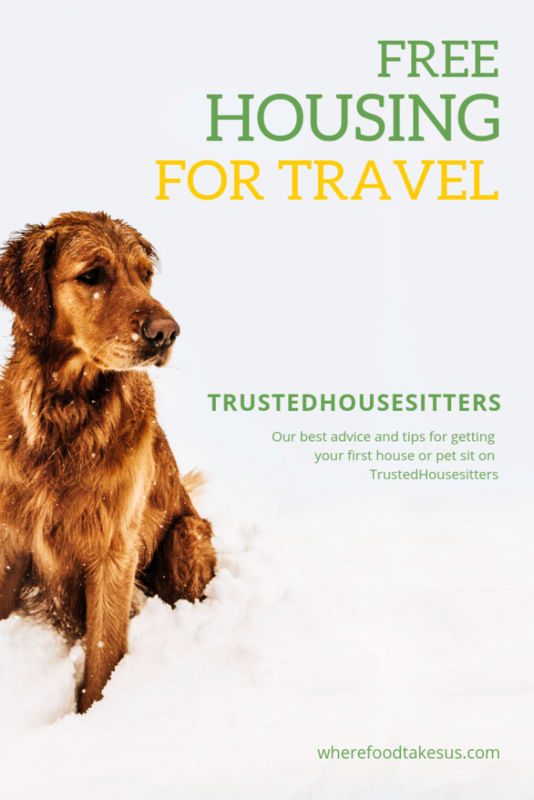 If your travel plans aren’t for some time, try house sitting for some people in your local area through TrustedHousesitters. Having those past sits under your belt can really help your odds of getting your foot in the door internationally, especially if they review you publicly and write an additional reference for you. Our sits begin in March 2019. Every host has been very kind and great to talk to. It’s so exciting to get the email that says you’ve been invited for a sit! We hope you can use our experience and tips to successfully get house sits for your travels! 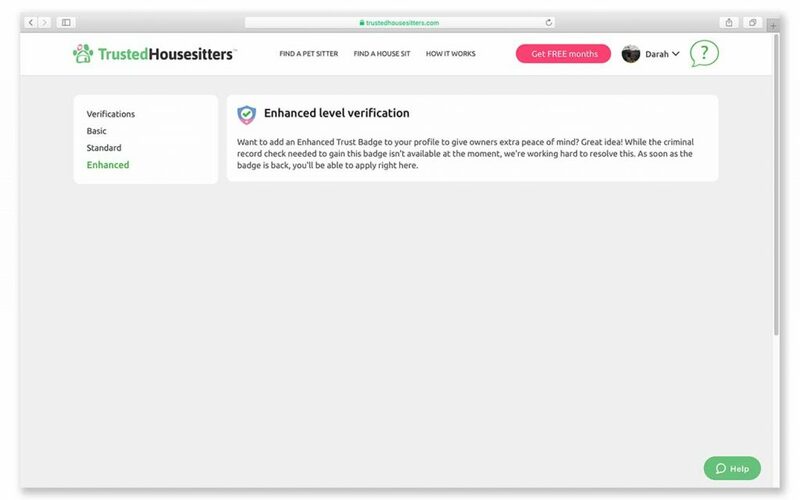 If you have any questions about Trusted Housesitters or any other house sitting platform let us know! Is house sitting the cheapest way to travel? It’s definitely one of them! 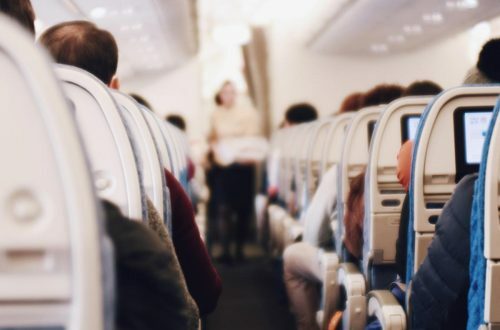 Check out these other ways to save money while traveling! Wow! 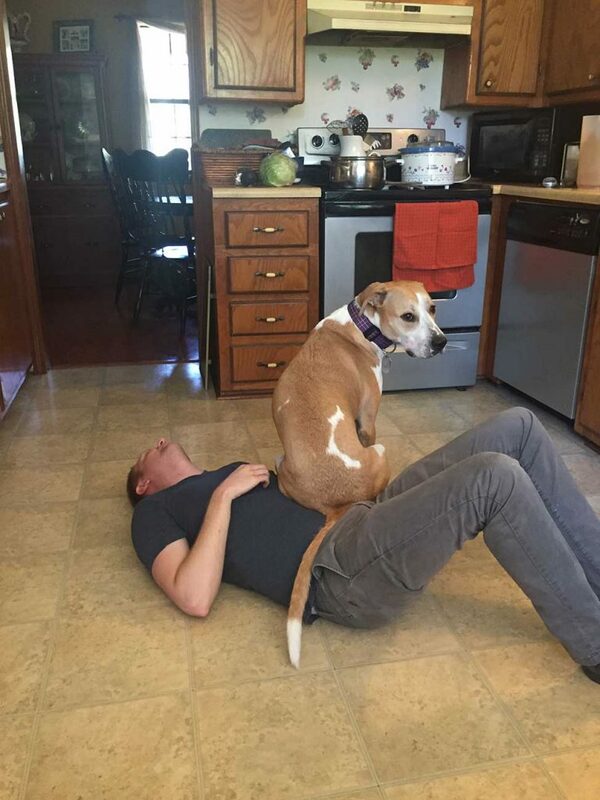 You got a 5 month sit? We got a bunch of shorter sits to fill up 10 weeks in the UK. 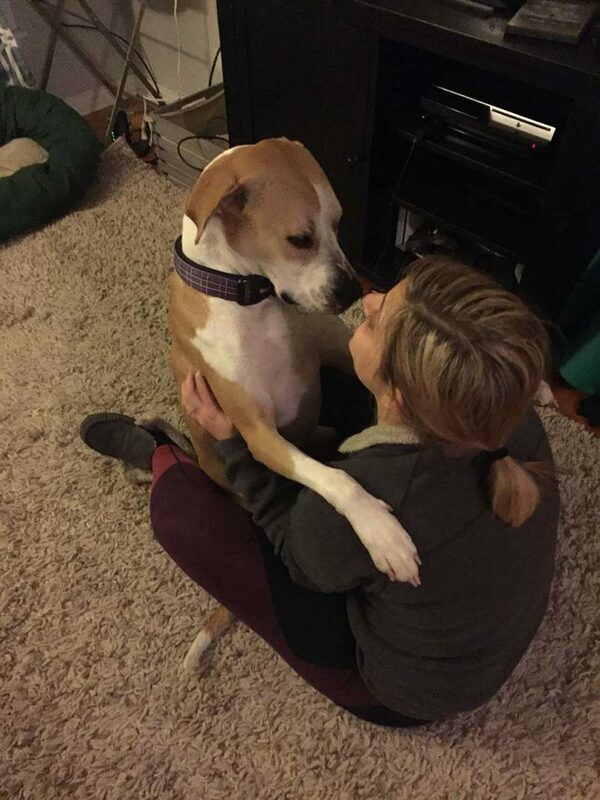 I hate to think how we’ll be when we have to say goodbye to all the dogs we’re going to be watching. Thanks for the well wishes! Good luck with your travels and saying good bye after the 5 months end :(. What an interesting concept! Seems like a great way for dog lovers and travelers to make a trade that makes life easier for everyone. On sites like this first impressions and a strong profile are everything and you have some great tips, thanks for sharing! Thanks for commenting! Yes, it’s a way for us to cheaply travel and also lets us love on some pets while we dearly miss ours back home. A great idea for pet lovers and travelers out there. What a great idea!! I’ve heard of other people doing this, but never heard of this website before. This is such a great post chocked full of useful advice and tips. I’ll have to consider house-sitting for my future trips! We think you should! We began our travels before realizing this as an option but it’s really going to save us a lot of money once we get in the UK, where housing can be quite expensive! Thanks for your comment. I have heard of these but haven’t ever applied. I think I’m scared of the “what if something happens” scenario. I’m curious as to what’s in place for your protection in that direction? Outside of that, I’m actually think it’s really neat and a great way to travel and would totally be interested! We’ve worried about the same thing! We did some research on it and really can only say that quick and open communication with the owner is the best practice. 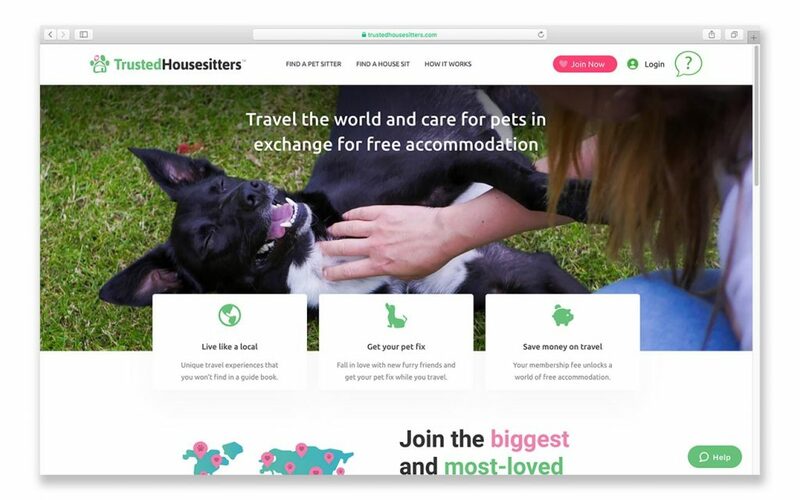 Trusted Housesitters does offer a Vet Advice Line 24/7 and the owners we’ve booked with are giving us their veterinary info as well. There is no insurance offered through the company so that would be something the sitter should seek out on their own. Hope you give it a shot! We have applied for trusted house sitters but haven’t had any sits yet. Great hint about pet photos with as many different animals as possible. I could see how it pays to show love and variety in your animal choices. We definitely think that’s the main reason we got so many sits in 2019 but it did take us a few weeks of applying to sits daily before we were invited to sit! If you need any help we’d be happy to assist you! This is such an amazing idea! I’d love to do this more when I retire with my husband. A lot of people have recommend Trusted Housesitters to me but you’ve certainly convinced me. We jumped on the idea the minute we discovered it! So far we’ve had a great experience even though our first sit isn’t until March. It’s very popular in North America so it should be easy for you to find a sit! We’re sitting in the UK for the same reason (to keep the cost down). What a GREAT post full of useful guidance made all the more useful by your entertaining writing style and personal tips. I can say from similar personal experience (not applying to housesit mind you) that the cut and paste method of filling out multiple applications does have its pitfalls, not the least of which is incorrect names for people (and in your case, pets). Time saving only saves time if you get it right first time around. Yes haha it definitely backfired on us but it was a lesson learned. Thank you for reading! This is a really cool traveling tip! I’d say that many of us budget travelers haven’t even considered this option, thank you for walking us through how to set up a profile & the best way to get a gig. No problem! If you do try to housesit just keep applying! We didn’t get one until after a few weeks of applying nearly every day. It can be discouraging to get rejected all the time but the first sit invite is so exciting!